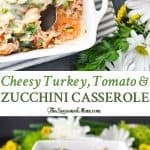 Aunt Bee's healthy CHEESY TURKEY, TOMATO AND ZUCCHINI CASSEROLE is full of fresh Italian flavors for an easy dinner that the entire family can enjoy! 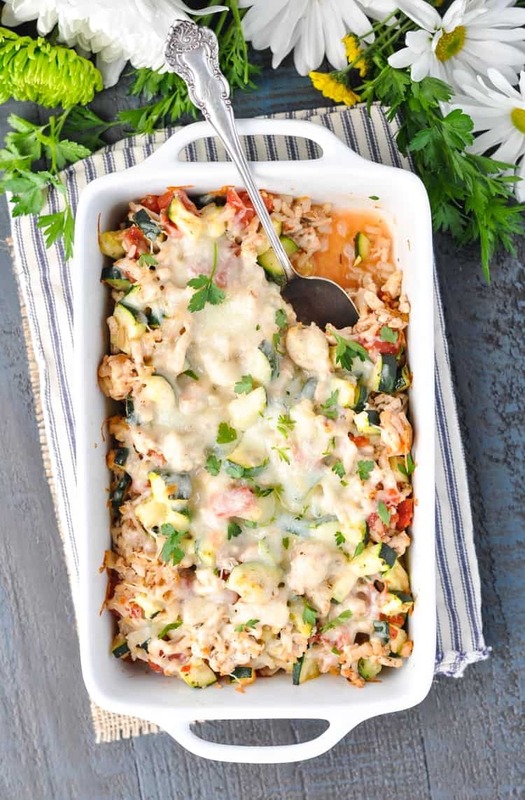 Aunt Bee’s healthy Cheesy Turkey, Tomato and Zucchini Casserole is full of fresh Italian flavors for an easy dinner that the entire family can enjoy! The freezer-friendly one dish meal combines vegetables, lean protein, and brown rice in a simple and wholesome prep-ahead supper. Every home cook needs at least one good zucchini recipe, right? It’s the quintessential summer vegetable that seems to thrive in just about any garden — no matter how neglected the crop may be! 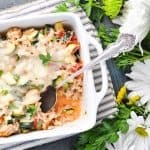 I will always be a huge fan of Zucchini Pie, but last year I was pleasantly surprised by how well the green squash also worked in my Chicken Penne Casserole with Corn and Zucchini. I’ve decided that mild zucchini is a wonderful way to bulk up any casserole (or meatloaf), making the dish more filling and satisfying without adding any significant calories. With a casserole full of healthy vegetables and lean protein, there’s more room for the cheeeeeeese! This dish was adapted from a similar recipe that Aunt Bee sent me. She originally clipped the recipe from her local Wilmington Star newspaper, and sent it to me because she knows how much we love easy casseroles. I emphasize the EASY — because in my opinion, there’s just no other way to cook! 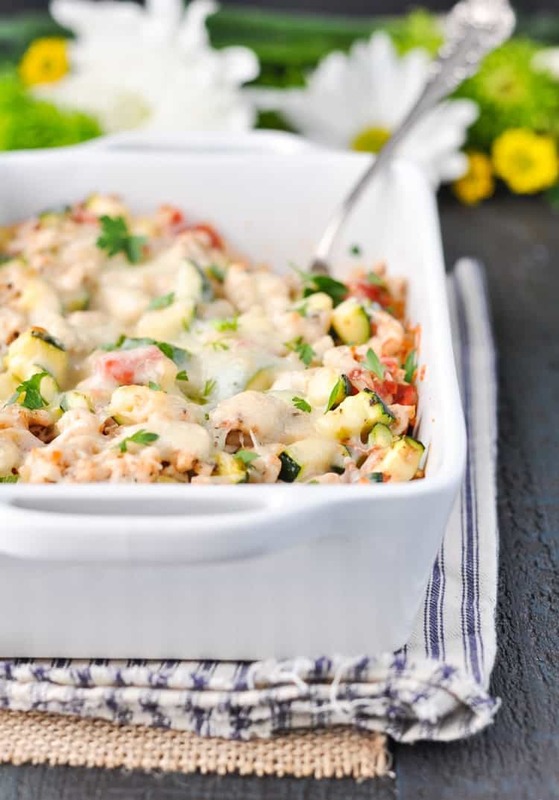 Even though the healthy zucchini casserole comes together in a matter of minutes, it’s loaded with flavor thanks to plenty of garlic, onion, and Italian herbs. You just can’t go wrong with that combination of ingredients! 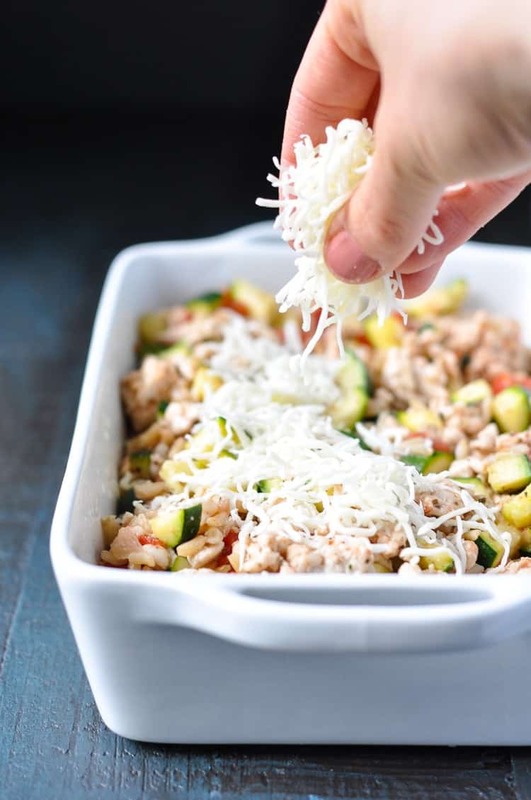 If you find yourself eyeing the inexpensive in-season zucchini at your local farmer’s market, or if you’re staring at bushels of freshly-harvested zucchini from your own garden, then do yourself a favor and whip up this delicious weeknight dinner! It’s even a freezer-friendly option that you can prepare in advance and stow away for a busy day. Easy, fresh, and tasty are all wrapped up in one beautiful package (or dish)! Cooking for Just Two? Just cut the ingredients in half and prepare the casserole in an 8-inch square baking dish. Want to Prep Ahead? Prepare the casserole as instructed through Step 3. Top with the mozzarella cheese, allow to cool to room temperature, and then wrap tightly. Freeze the casserole for up to 3 months. When ready to bake, just thaw the casserole in the refrigerator overnight. Proceed with baking as instructed in Step 4. Preheat oven to 350F (180C). Spray a 9 x 13-inch baking dish with cooking spray and set aside. In a large skillet, heat about 2 teaspoons of olive oil over medium-high heat. Cook turkey, onion, and garlic in the skillet until no longer pink. Drain off any fat and return meat to the skillet. Season with salt and pepper, to taste. Stir in zucchini and cook over medium heat for about 5 more minutes. Stir in rice, tomatoes, Italian seasoning, and Parmesan cheese. Pour mixture into prepared baking dish. Top with mozzarella cheese. Bake, uncovered, for about 20-25 minutes (or until cheese is melted and casserole is bubbly). 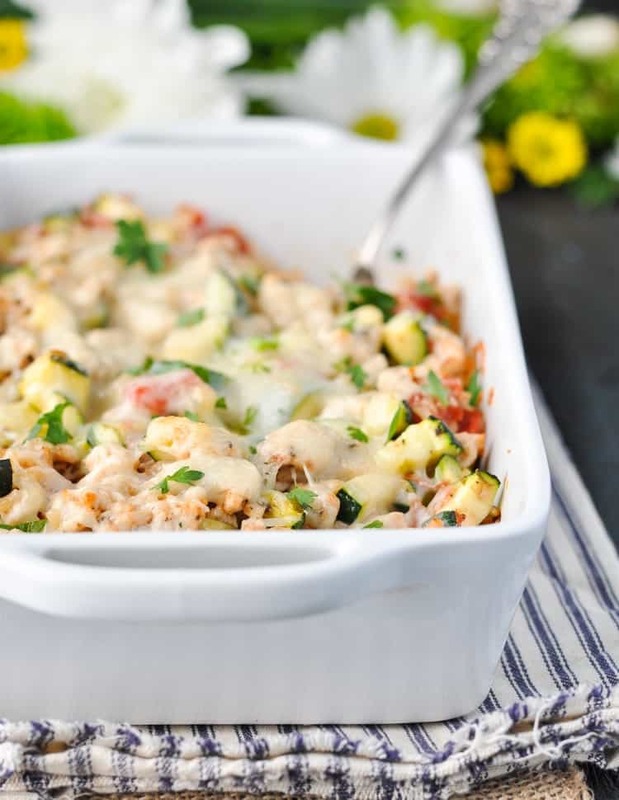 Zucchini recipes are a definite must, especially when it comes to casseroles. This looks like such a delicious dish for the summer! And I love the ingredients too…sound light but still filling and full of flavor. Just what I want for dinner tonight! Can I replace the rice with cauliflower? Made this last night! Two 8×8 pans, one to freeze. It was great! I added some fresh tomatoes and diced prosciutto. Since the prosciutto was salty I didn’t add any extra salt. Highly recommend! 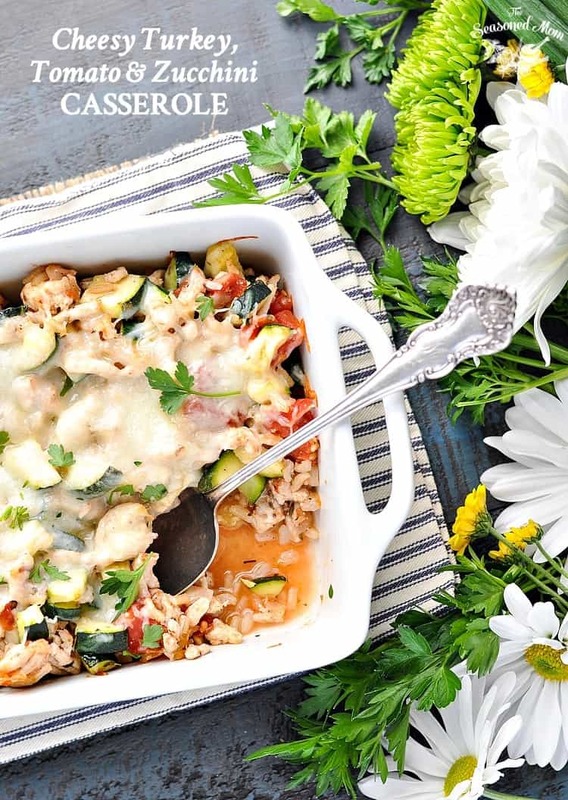 A great casserole to add in any leftover veggies/protein you have! You’re the best, Sallie! So glad that you enjoyed it! And yes…the prosciutto sounds like an amazing addition! This casserole sounds so delicious, it’ll go down well in my house!